I wasn't going to write anything on my blog about the situation I've found myself in recently, but I'm the victim, not the person who committed the crime, so why should I hide away from the place that's saved me so many times before? On Saturday the 6th of August, my next door neighbour exposed himself to me in our gardens, separated by a chain fence, resulting in him getting arrested by the police, however, as he admitted the offence by saying it was an accident, the police couldn't do anything more. The ordeal has affected me quite badly, more than I ever thought it would. For the first 24 hours, I was shocked, don't get me wrong, I felt so many other emotions but shocked was what I felt the most in that first 24 hours. Then come lots of other emotions, ones that won't go away, still now 10 days later. My son has seen his mum cry every single day, more than once a day, he's seen his mum in a right state, he's heard his mum continuously jumping every time the door knocks, he's seen his mum on the edge, he's seen a big change in his mummy, the woman who's always strong, the woman who holds it together. Today is the first proper day I've been left alone at home with Spud, since the incident happened, I've had people round me all the time, my friends and family have been amazing, so have Victim Support. Yesterday though, a part of the old me came back, the me who said no one is changing or ruining my life. I admit defeat in a way, he has changed me, drastically, but I won't be afraid in my own home. I'm not afraid of him anymore, I'm afraid for him. I come from a very big family, and he's seen most of them since the incident happened, if he wants war, he can have war. We're ready. The police let me down, and although I will continue to call them if more happens, I worry, there's only so much one human can take and I willl go to prison for my son. 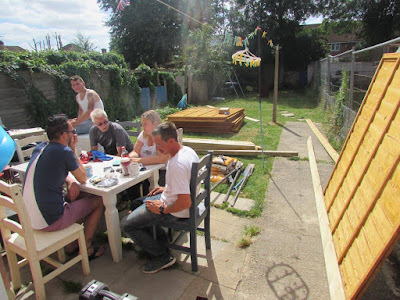 I've had abuse shouted over my fence, and nails and screws put into MY fence. 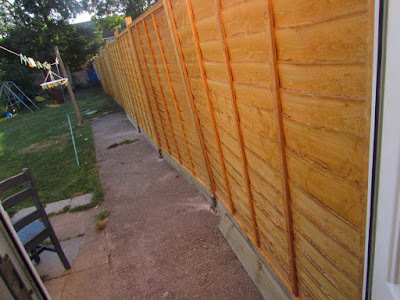 The fence that I had to go and spend £440 on, lending money from family members to give us some privacy from the pervert. Before this incident happened to me, I'd read articles of the police seeking a man exposing himself, and wondered why there was so much about it, now its happened to me, I know how awful it leaves the victims feeling. Being scared in your own home, in your own company isn't normal nor right. I'd be lying if I said I believe this man won't do it again. After all, I'm at the very least his third victim! I've found out about his two previous victims, and spoke to one of them, and she felt disgusted and weary just like me. To say it changes you is an understatement. However, no one, no man, no woman will break me. I will go on and I promise you one thing, when the pervert drops down dead I will throw one MASSIVE party to celebrate his death! There's a lot more to this story, and whilst I appreciate I have the freedom of speech, I realise there's snitches living here, and we all know what happens with snitches, it will just cause more trouble. I was the victim, he wanted me to be afraid of him, he won for a little over a week. No more pervert, I promise you that. I will make your life as uncomfortable as you try to make mine. Carry on putting nails through my fence, trying to cause injury, because I'll just keep smacking them back through. Carry on trying to intimidate me with your guest, I'll bring guest round too. In the blink of an eye, my family was round the very next day to put up a fence to protect mine and my son's face from his ugly mug. 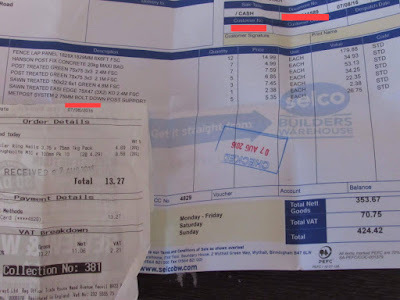 Various places of work was called notifying employers my family members wouldn't be in. Another time I had to call my brother who arrived with lots of friends after getting abused over the fence, they soon shut their mouths then. I will not let you victimise me anymore. I read about what happened on Facebook and was shocked for you. I can't believe he got away with what he did. What a shocking story and to read that hes not only done this once but at least 3 times is disgusting. And to hear he has got away with it with the police. Well done for being brave and standing your ground! I think in your position I would be putting in a complaint against the police. It's difficult to understand their decision not to charge, but they should have had some concern and consideration for you as the victim regardless of their decision. I also think that your landlords should probably take action against him in some way. The fence looks good though. Maybe you could paint it and plant against it so that it becomes positive in more ways that one. Thank goodness for your family! It sounds awful and I'm so sorry you have to live next to this man. Also recommending that you keep a diary and photos of anything that happens.